My 4 mile planed run turned in to a 6 mile run. I was feeling good running today and decided at the 2 mile point that I would run 5 rather than 4 then at the 3 mile point I up it to 6 miles because I was feeling great! Did 6.04 miles in 1:03:27 hours at and avg pace of 10:31/mile. I could have still gone further but didn’t want to push it before my 16 mile run tomorrow. The stuff my wife ordered for me came in the mail today! I didn’t know she bought me a Saucony Speed Run Visor because I’ve been complaining about all the sweat running into my eyes; this the visor icimage recommended. I used it today and it worked perfectly. 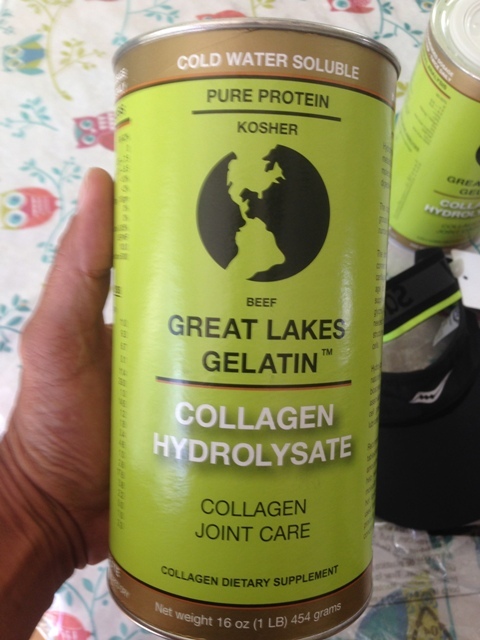 She also ordered me two more can’s of Collagen Hydrolysate by Great Lakes Gelatin I keep one can at home and one at work working out of two can I get a little over two months so one month per can. I’ve been taking this stuff now for 3 months. You see when I was really young my mother got into a car accident; I was propelled out the front window of the car breaking my legs and one arm. Also as a result of that feat of psychics my neck has an ‘S’ shape to it. Now this never bothered me until about two years ago; well I guess that’s not really true I’ve always had to use a pillow that supports my neck, that injury is now arthritic. The past two years, maybe three have been painful; my wife also suffers because I always ask her to massage my neck; sometimes it would get so bad that I would get desperate and pay $60.00 US for a massage but it would only last for awhile and the pain would come back. My doctor gave me prescriptions for pain killers but I never filled them because I really hate drugs and love my kidneys. I take supplements and Glucosamine (yeah I know its a supplement too) does the Glucosamine help? I don’t know for sure been to afraid to stop taking it to find out. But I can tell you that this Collagen Hydrolysate does! I’ve been nearly pain free for over two months that’s not to say that I don’t sometimes have a little discomfort but I’m not in pain. As an added bonus it works great for recovery after my runs! I take one rounded tablespoon once in the morning and once at night mostly after I run. It has no taste at all so I just add it to my water along with my electrolytes. If you have joint issues check it out I don’t know if it will help you but it sure as heck helped me. And no I don’t work for this company. I just get the stuff on Amazon. 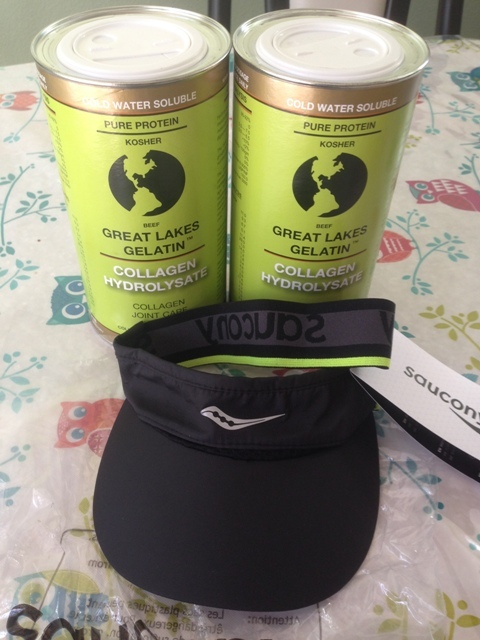 This entry was posted in health, Running and tagged 10K, 6 miles, Collagen Hydrolysate, Glucosamine, Great Lakes Gelatin, joint health, joint pain, knee pain, neck pain, running, Saucony Speed Run Visor. Bookmark the permalink. I’m going to have to look into this.